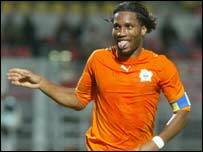 The Ivory Coast beat Sweden 1-0 in an international friendly on Wednesday night in the French town of Le Mans. Striker Didier Drogba carried his good form with Chelsea onto the international stage with a goal seven minutes before half-time. Sweden played the tidier football but were punished for lax marking when the English Premier League's top scorer powered home a header after a cross from the left by Bakary Kone. Reigning African champions Egypt beat 2010 World Cup hosts South Africa 1-0 in London. Emad Moteab, who helped Ahly win the African Champions League on Saturday, got the only goal of the game after just three minutes. The biggest win of the night came in Rabat as Morocco thrashed Gabon 6-0. Bouchaib El Moubarki scored the only goal of the first half. The Atlas Lions then found the target four times in just eight minutes through Jaouad Ouaddouch, Noureddine Boukhari and Hicham Mahdoufi, before El Moubarki scored his second of the game. The rout was completed in injury time with Hassan Souari. Libya lost 2-0 to 2004 African Champions Tunisia at the Rades Stadium on the outskirts of Tunis. Chakib Lachkhem scored on his debut for the Carthage Eagles after 15 minutes and then 10 minutes into the second half Chaker Zouaghi made sure of the victory. World Cup finalists Togo were held to a goalless draw by their hosts Luxembourg. In Harare hosts Zimbabwe narrowly beat Namibia 3-2. The Warriors were leading 2-1 at half time thanks to goals from Evans Gwekwerere and Gilbert Mushangazhike, with Victor Helu on target for the Namibians. Former Zimbabwe captain Peter Ndlovu came on as a second-half substitute but Portsmouth striker Benjani Mwaruwari did not make the trip for the game, with his manager Harry Redknapp saying he was injured. In another game played in France Burkina Faso beat Algeria 2-1. Narcisse Yameogo opened the scoring from the penalty spot on the hour mark for Burkina Faso, before Koffi doubled the Stallions' lead 22 minutes later. Algeria's consolation goal was scored by Rafik Saifi with a penalty in the 86th minute. Angola were forced to cancel their friendly in Tanzania because their charter flight failed to materialise. The Angolan Football Federation accused the state airline TAAG of failing to fulfil a commitment to fly the side to Dar-es-Salaam for the match.